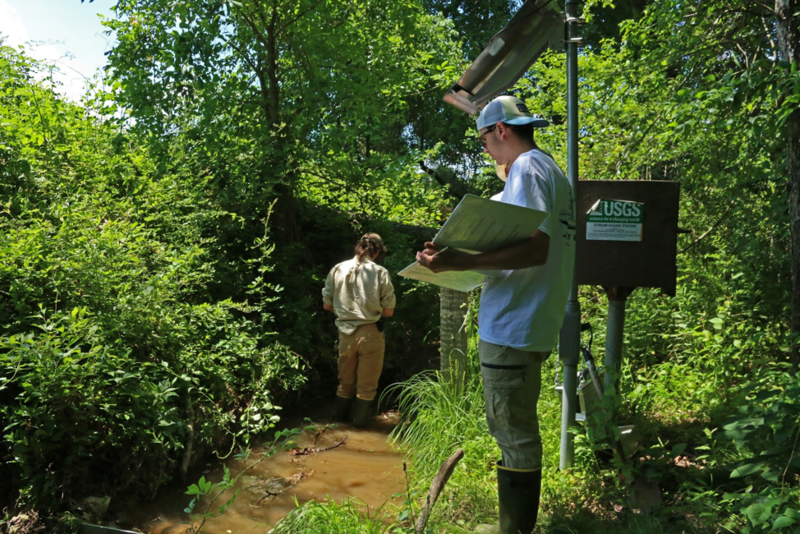 Student Nate Vandiver collects stream monitoring data with the BES team. Nate Vandiver arrived at the Baltimore Ecosystem Study (BES) offices early on a Friday morning. Pulling on knee-length boots over his long work pants, he helped gather sampling equipment and load it into a van for a day of stream monitoring. Vandiver is a high school senior at the Friends School of Baltimore, and at the end of their last year he and his classmates complete an internship to help them discover what they want to do in their careers. Vandiver leads the “Green Club” at school and plans to study environmental science for his undergraduate studies in Boulder, CO, so four weeks at BES provided the perfect internship for him. Packing the van for a full day of fieldwork in Baltimore. “A lot of preparation goes into science. You can’t just go out and ‘do’ science,” he explained to me while I rode next to him in the van, tagging along to some of the research sites. 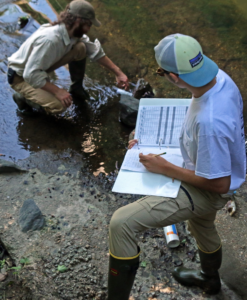 Every week, Vandiver helps staff researchers Dan Dillon and Ben Glass-Siegel with their stream sampling and other plots, recording data and experiencing first-hand the day to day effort required for long-term datasets. He hikes to the edge of a small stream behind a private school, picking his way to a rocky river shoreline beneath a bridge, scrambled down roots in a steep embankment, and making sure to always, always avoid poison ivy. In addition to one-on-one internships with students like Vandiver, BES offers multiple opportunities for middle and high school students to become directly involved in the research conducted there every day. Throughout the year, BES hosts events including training sessions in the Teacher Institute, the Baltimore Data Jam – an art and science competition for middle and high schoolers – and the Young Environmental Scientists (BES YES) mentorship program. Most recently, the BES YES high school students developed a complete stream assessment, including documentation of river features, pipe outfalls, plus protocols and data sheets. Nate Vandiver has now experienced fieldwork first-hand, a memory he can take to his environmental studies courses in college. Vandiver hopped out of the car at a BES sampling location along an urban river. Down a steep embankment, the water flowed swiftly and clearly, though the rushing sound of the current competed with vehicle traffic from a nearby bridge overpass. With the confidence of experience, he followed Glass-Siegel to the edge of the water, standing on the bank with a white binder full of data sheets as they read out figures from a data logger. By pairing students like Vandiver with world-class scientists, BES education programs play a pivotal role in inspiring the would-be researchers and scientists that may take over the long-term datasets and projects into the future. 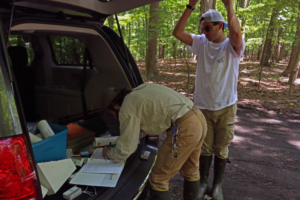 Vandiver no longer has to imagine what ecological field work is like, and his contributions to this long-term monitoring project will be valuable even long after his official internship ends.